Although not as popular in North America, England's Arena are widely regarded as one of the premier progressive rock bands in existence. Albums such as The Visitor and The Lion's Cage are considered classics in the genre by many. Arena's previous album Contagion, released in 2003, saw a dramatic departure from the pure progressive rock of past albums to a heavier edged and even prog metal flavored sound. An outstanding album, it was met with mixed reaction by their fans. Although many welcomed the newer and harder sound, the purists felt that Arena were becoming just another prog metal band and had lost the uniqueness and character that was such a staple of their music. With 2005 being Arena's 10th anniversary, they decided to do a special album to mark the occasion. Clive Nolan and company have come up with a collection of 7 tales of mystery and imagination using themes ranging from the Sherlock Holmes saga to more Marvel comics flavored stories. 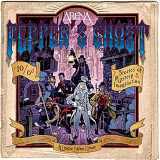 Their new album Pepper's Ghost takes it's title from a legendary Victorian era English illusionist who could allegedly "project" a ghostly figure onto the stage during his performances. The whole comic book theme comes full circle with cartoon strips inside the booklet used to help illustrate the story behind each of the songs and once again, all lyrics and stories are penned by keyboard wizard Clive Nolan (Pendragon, Nolan and Wakeman). Musically speaking, Pepper's Ghost still maintains the heavier edge to the guitars and the riffs as heard on the Contagion album but they've taken a step back and incorporated elements of their classic sound of previous albums like The Visitor. Bedlam Fayre gets things underway with it's big booming riffs and Clive Nolan's keyboards are perfectly blended with the guitars to produce a great thick sound. The guitar riffs and harmonized vocal lines by Rob Sowder really reminds me of the classic Canadian prog band Saga, especially the music on their 70's albums such as Images At Twilight and Silent Knight. Smoke And Mirrors continues with the heavier edge and more prominent guitar in the mix but the track is more mid tempo with big slicing riffs and Clive Nolan provides some nice synthesizer arpeggios. A great atmospheric track, the Saga sound can be heard again especially with the vocals and chorus sections. The Shattered Room is a 9 minute epic that features lots of tempo changes and instrumental passages with some great lead solo breaks by guitarist John Mitchell. The heavy guitar edge is still present but it's more of a "pure" progressive rock song which also features some Fish-era Marillion style vocals over clean guitar arpeggios. The Eyes Of Lara Moon is another solid atmospheric track that mixes quieter with heavier sections and has a more defined chorus than most tracks on the album. Tantalus also mixes quieter and heavier sections and takes on a very Fates Warning like quality with the guitar riffing style. Purgatory Road features a great thick Uriah Heep style of heavy guitar riffs blended with swirling organ sounds that sees many different tempo changes. The album ends with a 13 minute opus entitled Opera Fanatica. The big booming guitar riffs are front and center again and the use of chunky and heavy riffs gives Arena an unusual prog metal flavor and a heaviness that's quite rare for their music. Using quiet reflective interludes and recurring themes, this one pretty much covers all the bases of the Arena sound.